It not always easy to find fresh peas. It’s a short season in the Northeast and very weather dependent. I’ve never seen them in any market. But lucky for me, they were abundant at my Columbus Avenue Sunday farmers’ market. Kernan Farms, the only stand that has them, is from Bridgeton, New Jersey — about 2 hours from NYC and near where I grew up. I swear there’s something in the soil there that makes everything taste so much better than produce from other areas (or maybe I just like what I grew up eating). Not sure this qualifies as eating local, but it’s surely eating well. 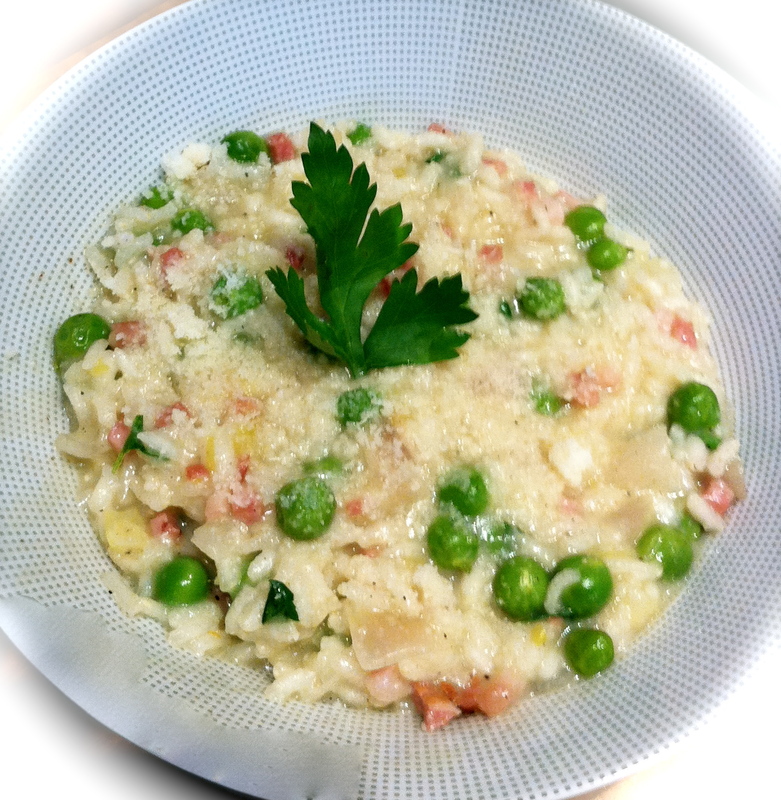 So when the weather is still cool, like it is here this week, I love to use them for a special risotto, Risi Bisi (rice and peas in the Venetian dialect). As with any risotto, it’s all about the quality of the ingredients and the amount of love (and stirring) you put into it. This dish takes about 25 minutes, including prep, so it’s still perfect for a weeknight. Melt butter in a large saucepan over medium to medium low (my Viking runs hot so I have to watch it). Saute the pancetta and onions in the butter until the onions are translucent. (Note: If your butcher or deli counter does not carry pancetta, you can find Citterio pancetta already diced in most supermarkets these days.) Then add the rice. Saute for about 2 minutes until you see the whites of the rice. Next, add in the wine and saute for another minute or so until it’s absorbed. The stock follows, little by little. I like to add about 1/4 cup at a time, stirring until it’s soaked up and then adding more as needed. Now you will keep stirring and adding stock for about 20 minutes in total or until the rice is slightly soft to the bite and becomes creamy. If the peas are fresh or thawed, they don’t need much cooking. I add them around 15 minutes through the cooking time, depending on how large they are. If, however, you’re using frozen ones, then add them with the rice. Once the rice is cooked to your liking, stir in the cheese and parsley. Add the salt and pepper to taste (the cheese and pancetta will make it salty, so please taste first.) If serving as the main dish, ladle it in a large bowl, and top with more cheese and fresh parsley. Or it’s good as a side dish with a simple grilled pork chop. Nothing too fancy or it will overpower the risotto. Have a glass of whatever wine you used for the dish (try the Sant’Elena Pinot Grigio, which has a pinkish golden hue and is excellent for around $20). Then breathe in the scent of springtime in Northern Italy.